An earth sheltered home uses dirt, rocks and other earth elements as insulation placed outside walls to reduce heat loss when it is cold and keep the interior of the home cool when it is hot. People who are interested in sustainable architecture methods of constructing shelters and passive solar energy utilization with which to operate appliances are popularizing this type of dwelling by informing the public of its real advantages. Three different types of these unique homes exist: subterranean, earth-bunded and earth-covered. 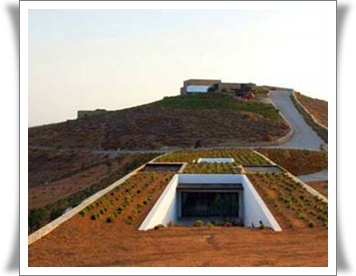 Covered with a thermally significant material such as dirt, a subterranean earth sheltered home is completely insulated except for the roof in which a doorway or other entrance is integrated in its construction. Homes that are earth-covered have the thermally effective material covering the roof only and resemble an earth-bunded home. When a building is earth-bunded, this means that the earthen material is used to insulate one or more of the building's sheltered elevations. Bundings are total or partial and are sometimes referred to as "bund walls". A bund wall is an area inside the home that is meant to inhibit many kinds of breaches, such as inundation. If the climate is predominantly wet, build the home near trees because their roots will remove excess water and protect the home from inundation. Taller vegetation may provide barriers to brisk winter winds in addition to preventing erosion to the home due to deep roots giving excellent structural assistance to the home. Soil with good draining capacity and bearing ability such as a combination of gravel and sand are suitable in which to build an earth sheltered home. Well-graded gravels generally offer bearing capacities of nearly 8100 pounds per square foot as well as a reduced frost heaving. Frost heaving occurs when ice develops under the soil in temperatures of 32 degrees Fahrenheit and lower, a condition that could result in structural damage to the home. Although clay soils are the least vulnerable to erosion, they do not allow for proper drainage and increase the possibility of frost heaves. In addition, clay is much more likely to expand and/or shrink during rapid temperature fluctuations, creating problems similar to frost heaves. Economical and strong, reinforced concrete is the most frequently used material with which to build an earth shelter home. Although it outlasts untreated wood and is easier to manipulate than steel, reinforced concrete is not the most earth-friendly of materials. However, the concrete industry has responded to the increasing demand for these types of homes by creating brands like Hycrete and Grancrete. In addition to being more environmentally friendly, Hycrete and Grancrete remove the necessity for homeowners to provide additional waterproofing measures. Survivalists like these homes because of their ability to resist earthquakes, tornadoes and hurricanes. As a dwelling that is structurally superior to traditional homes, these homes move with the earth instead of bucking against it like conventional homes do during an earthquake. Furthermore, in the event of a nuclear world war, the extra layers of earthen protection offer the best kind of defense against potentially fatal radiation fallout. An earth sheltered home offers various benefits, which include tremendous savings on energy costs by using the earth as a free thermal mass, providing competent protection against the elements and the ability to incorporate passive solar construction designs. In addition, a minimal amount of apertures and the natural soundproofing ability of the earth enhance privacy and keep the noises of civilization from seeping into your bedroom.